They both need capital to get their projects off the ground—but where can they turn? Historically, they’ve had limited options—they can get a loan from the bank, or they can borrow money from their friends or family. But now they have a new option: Crowdfunding. Crowdfunding is an emerging trend where many individuals each make a small financial contribution toward a project—and together, these contributions add up to enough money to get a new project off the ground. For example, if the project is a documentary film, the reward might be free tickets to the first screening. Or if the project is a video game, you might receive a free copy of the game. Two of the most popular rewards-based crowdfunding sites are KickStarter and IndieGogo. Now, to be clear, if you donate to a rewards-based project and the project turns into a huge financial success, you won’t receive any of the profits. Not a dime. Equity crowdfunding is similar to rewards-based crowdfunding, but there’s one MAJOR difference..
With equity crowdfunding, when you make an investment, you’ll receive an actual ownership stake in the business you back. As just one example… when Facebook went public, its first investor earned 2,000 times his money. More recently, a robotics start-up called ReWalk raised capital using equity crowdfunding. 14 months later, ReWalk went public on the NASDAQ... and it’s early backers made a 500% return. And these backers are regular investors, just like you! And with the potential for higher returns comes higher risk. And if you do invest, only invest a small amount of your total capital. 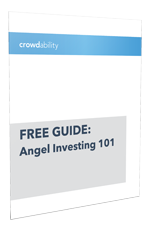 At the moment, equity crowdfunding is only accessible to what’s called “accredited investors.” An accredited investor has a net worth of at least $1 million, or earns at least $200,000 per year. It’s called “The JOBS Act,” and we believe it will completely change how America invests.